Icelandic investment group Baugur - the name behind Hamleys and House of Fraser - is considering relocating to the UK. Baugur confirmed it was examining the switch plan after the recent sale of its remaining Icelandic investments. The move is part of a plan that would see the firm focus on its UK assets - which make up 85% of its portfolio. It will also allow Baugur's chairman Jon Asgeir Johannesson to remain at the helm after a conviction in Iceland for book-keeping offences. Last month the country's Supreme Court upheld the conviction of the chairman for breaching book-keeping rules, but threw out charges of fraud and embezzlement. A Baugur spokeswoman said it made sense for the investment firm to move its headquarters to London, because as a "premier financial centre... it makes sense for the company to be where its assets and source of funding is". Under its current restructuring drive, Baugur has sold its loss making MK One fashion chain and its stake in the wholesaler Booker for £70m. Most recently it sold its Icelandic retail assets including the Bonus supermarket chain, to the Johannesson family's holding company. The firm is now concentrating on its UK assets which include the Iceland food chain, Mosaic - a fashion conglomerate that includes Oasis and Karen Millen - as well as stakes in Moss Bros, Woolworths and French Connection. 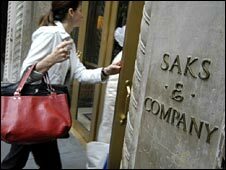 It also owns a stake in US retailer Saks department stores. In recent months the group has outperformed much of the UK retail market, recording like-for-like sales growth of 3.9%.